Running is a tough activity for most people, but I strongly believe that it is the best exercise for the body. Running not only strengthens the heart, but tightens the body’s muscular structure as well. It is definitely not easy on the knees, but with proper training and footwear it can be a do-able activity. For starters, I recommend interval training. 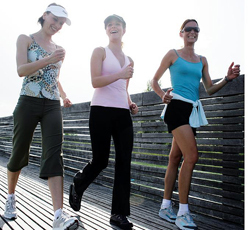 This type of training consists of short spurts of running/jogging with spurts of walking. For example, walk for a minute and run for thirty seconds, then repeat over and over until your work-out session is over. Increase the run time and decrease the walk time each week until you find yourself running/jogging the entire time. I have put together a few exercises to help get you started. These exercises are designed to increase the heart rate and help train the body for endurance. I recommend doing three sets of 15 to 20 repetitions. I also recommend incorporating jump-rope into the mix as well. Good Luck! !